No explanation is given for why Staks is a Guardian cadet when he had previously been a seasoned veteran since the pilot. He does not reappear with the Secret Riders. Staks converts from robot to Peterbilt 352H long-nosed semi-cab. Originally released as Big Truck Robo in the Big Machine Robo line in Japan. A second release of the previous Staks toy, this version comes boxed with a transport trailer. The trailer can carry and store regular sized GoBots vehicles. 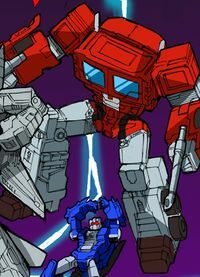 Staks's Cybertronian-style body in the "Cataclysm universe" is modeled on Combiner Wars Optimus Prime, with the head folded in. This page was last edited on 22 November 2017, at 03:23.